Clean Work Station for non dust working area. Unitcomprising of HEPA / Pre filter, Motor blowing assembly, Manometer, Tube Light. Horizontal & Vertical Model to meet requirement. 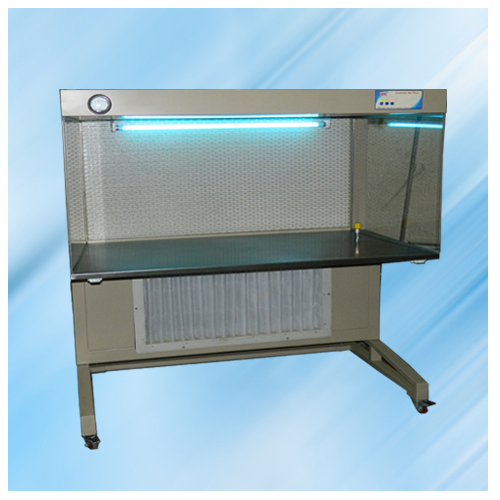 HMG Design, Manufacture & Install Clean Work Stations. 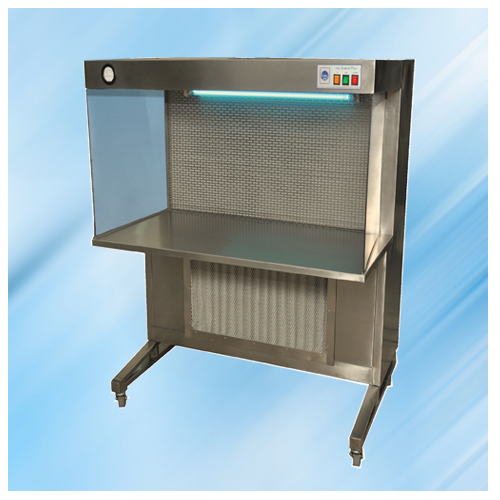 Laminar Flow Benches, Mobile Enclosure, Biological Safety Cabinets, Powder Dispensing Units, Garment Cubicles, Pressure Module, Pass Box and other Air-filtration Systems & Filters to Control Airborne Contamination to meet individual requirements. Our Equipments meets Class 100 Cleanliness as per US federal Standard 209 E.
Unit comprising of 95% efficient @ 5 Micron PREFILTER, inclined pressure differential manometer & 99.97% Efficient as optional. Excellent non-dust generating. Easy to clean white laminate / S. Steel exterior. Low Whisper smooth noise free operation less than 60-65 dB. Variety of MOC i.e. Wooden Laminated / CRCA Powder Coated finish or full S. Steel. 4) Front Acrylic door / PVC Strip Curtain. 5) Satin finish S.S. working table top. 6) Castor Wheel for easy movability. 7) Vacuum / Gas coke. 8) Satin finish S. Steel Table Top. Due to continues R & D model & specifications may change. Picture shown with Optional accessories.